WHY IS HYPERBARIC OXYGEN BENEFICIAL? Reduces gas bubble size so they can be reabsorbed. WHAT DOES HYPERBARIC OXYGEN DO? Healing of nerve endings and reduction in pain and pain cycles. There is 21% oxygen in the air that we breathe, and our lungs transfer this oxygen to our red blood cells (via haemoglobin). These oxygen-filled red blood cells are carried around the body by the plasma (fluid), which travels through the blood vessels. The oxygen has to diffuse into the plasma then is picked up by the surrounding tissue to ensure that it is delivered to where it is needed. Many medical conditions affect the network of arteries and veins that carry blood to and from the body’s tissue. Such damage is generally referred to as peripheral vascular disease. 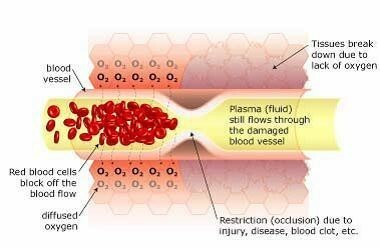 When there is a restriction (occlusion) ischemia (lack of circulation) in blood flow due to surgery, illness, or injury, the red blood cells block the blood vessel and are unable to transfer oxygen to the cells on the other side of the occlusion. This causes swelling and starves the area of oxygen, causing hypoxia (a lack of oxygen). When this occurs the tissue begins to break down. Hypoxia triggers ‘apoptosis’ (programmed cellular degeneration – clumping and clustering of damaged nerve cells surrounded by healthy neuronal tracts). Apoptosis modifies the expression of plasticity (the ability of the body to repair). Apoptotic bodies and altered DNA fragmentations are observed in the avascular ischemic region with increased inhibitory biochemical factors (proteins) released into the damaged parts of the brain and spinal cord causing further deterioration. Apoptosis has been identified in all neurodegenerative disorders including brain and spinal cord injury. Apoptosis fosters the cycle of continued dysfunction, degeneration and ultimate neuronal death. Whilst breathing 100% oxygen and the elevated pressure (1.5 to 3.0 atmospheres) increases the amount of oxygen present in the plasma and available to tissues. This oxygen-rich plasma is able to travel past the restrictions, diffusing up to 3 times further into the tissue. The pressurized environment by this action helps to reduce swelling , ischemia and discomfort while providing the body with at least 10-15 times its normal supply of oxygen to assist in prompt and effective repair of tissues compromised by hypoxic conditions caused by impact or disease. Hyperbaric Oxygenation (HBOT) simply increases the saturation of tissue oxygenation, slowing and reversing hypoxic induced apoptosis – restoring blood supply to the compromised region by the development of new capillary networks (neovascularization) enabling the body to alter the course and impact of the disease process. HBOT mobilizes the body’s circulating stem cells. 40-hours of HBOT; circulating CD34+ cells increases eight fold (800%). Hyperbaric oxygen shrinks the size of gas bubble so that they may be reabsorbed. Hyperbaric oxygen therapy is important in the treatment of arterial gas embolism and decompression sickness. 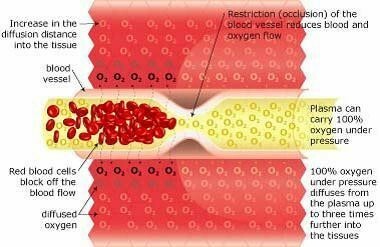 Elevated levels of oxygen cause vasoconstriction that leads to a reduced blood flow without significantly affecting oxygenation. Hyperbaric Oxygen is used to control compartment pressures in crush injuries and to treat thermal burns. Super oxygen saturation of tissue stops the spread of certain toxins and enhances the killing of bacteria. This is important in the treatment of gas gangrene and necrotizing tissue infection. Hyperbaric Oxygen promotes the growth of new blood vessels by enriching the area with oxygen carrying blood. Although decreased oxygen tensions stimulate angiogensis; for it to be effective, there must be an underlying scaffolding of collagen to support it. Overall, therefore, hyperoxygenation simulates useful angiogensis. If you have any questions or require more information then please contact us. Copyright HBOT IOM, Registered Charity in the Isle of Man No 1274, Sitemap, Website Provided by 3 Legs Ltd.